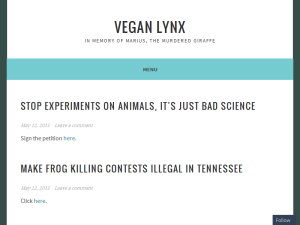 This what your Vegan Lynx Blog Ad will look like to visitors! Of course you will want to use keywords and ad targeting to get the most out of your ad campaign! So purchase an ad space today before there all gone! When the new EU law comes into effect I shall have to stop sharing links to articles. I think, but I’m not sure, that I will still be able to post links to petitions and donations sites here. Again, I’ll have to find out for sure before I post any links. This all reminds me of an old eigthties song that shares its name with a famous book classic. See – it’s starting already – I’m afraid to put anything resembling a title in this post. At least I’ll still be here, or I think I will. Sadly, we live in interesting times. Because of a new EU law, I may have to close down this blog, or at the very least stop posting and probably delete all posts containing a link, which means practically all posts. Needless to say, I’m extremely displeased. I’m not even sure I can continue blogging at all. Even if I only use my WordPress.org blog and post ’ordininary’ blog posts, it may be too complicated to bother. Can I even post photos I’ve taken with my own phone? At this point, nothing is certain. My sister and I may be able to hand code our home pages/blogs like in the old days, and my sister is great at making graphics but again, I’m not sure what is allowed or not. It may not be strictly necessary for me to post links to newspaper articles or even reblog other people’s posts, even though I think it’s important to share info with others with the same interests and values. What I’d really like to continue doing is to post links to petitions and donations sites. How else are we going to be able to spread the word about important causes? With this kind of thing happening, I’m really concerned about the future. Actually, I already was, but this new law has added to the dark clouds gathering. What do you think? Anyone from the EU who knows about this law and can explain it to me? Anyone who has any opinion about this? I’d hate to lose touch with my friends here and on my other blog sites. If this means what I’m afraid it means I may still keep the blog up so my friends can keep in touch and I will probably still be able to keep up with non-European blog posts, but with a gag on me. Grr. I was going through my Tumblr dashboard and someone mentioned that there are ads on people’s blogs there. It’s something I haven’t noticed but if it’s true I don’t want my photo blog there. Could you take a look at it and let me know? Ok, I guess it was a little funny. When were leaving yesterday morning it was a little too early and dark and we were in a little bit too much of a hurry ;). Ok, I guess it was a little funny. When were leaving yesterday morning it was a little too early and dark and we were in a little bit too much of a hurry ;). Since I was a teenager, I’ve been trying to live cruelty free. I think, by now, I’ve learned to do it quite well. Ever from the start I’ve been aware of the other aspects of being vegan. Mainly the environment, since in my mid- to late teens, I didn’t worry too much about my own health. Being aware doesn’t necessarily help all that much. You need knowledge as well. Reading the advice in the media can be confusing. Everyone seems to have a different idea of what’s good for nature and the environment. This brings me to today’s topic: avoiding synthetic materials. For about five years I’ve had a cotton parka that I love. At about the end of April, which this year was the end of winter and the last few days before the beginning of the heatwave, I realized that it had little holes on one of the sleeves. Also, my baby bump had been a little too hard on the zipper. So now I’m going to need a new winter jacket. Since getting my last jackets I’ve realized the risks of micro plastics. 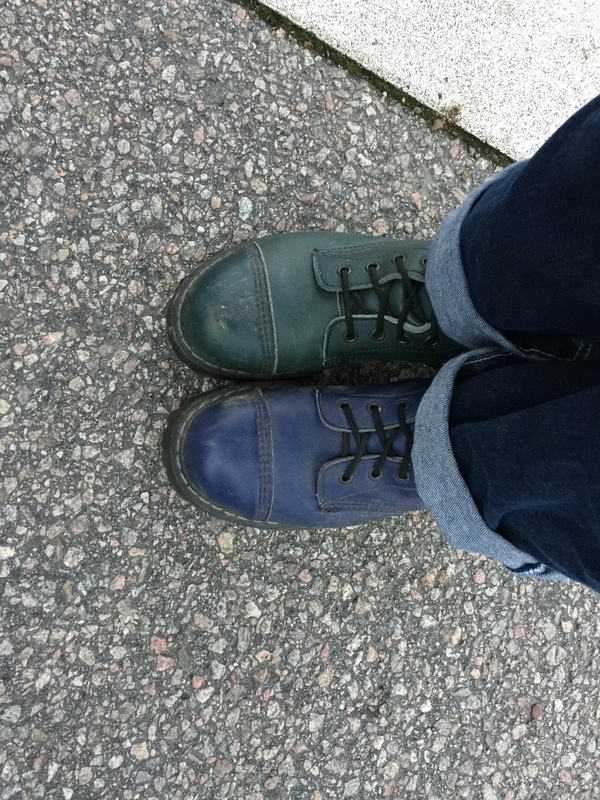 My dear old parka has a synthetic lining and my spring- and autumn jacket which may never be needed again if ’the wolf winter’ lasts until the heatwave begins again, every year, was all synthetic. Sadly, enough, because I love that jacket too. It’s so cheerful. So early in the summer I bought another thin jacket. Since it seems to be almost impossible to find an all cotton winter jacket, I’ve been thinking of trying to make do with the thin jacket all winter. It’s a scary thought considering how cold most of our winters are. What do you think? Could I manage to warm myself using layers of cotton? Specifically wearing knitted jumpers and cardigans? Or should I just try to find the money for a new winter parka, with as little synthetic material as I can get? Apparently, there are special bags to use in the laundry to minimize the shedding of micro plastics. I was also going to ask for suggestions for getting rid of all single use plastics instead of some, but this is getting lengthy so I’ll leave that for another time. This summer has given me much food for thought. Mainly it was the heatwave, the drought and the forest fires that were beginning to strike too close to home, but also the hunters that have been shooting close to our cabin. Also, the political situation is reason for concern. It seems to me that in just a few short years we’ve gone from circumstances resembling those shortly before the First World War to what’s more similar to the time just before the Second. (Even though Sweden was spared both wars in the end, by playing ’hedgehog’. ) Don’t get me wrong. I’m not saying we’re heading for an actual world war or even a more limited conflict in Northern Europe. The enemy is most likely smarter than that. At least for now. But there are other serious crises we’re risking. Maybe even civil war. Again, I doubt this will happen in the next year or two, but there are plenty of other scenarios that could unfold that could have equally serious consequences. Foreign powers subverting our election. Acts of terrorism. Desinformation campaigns. Coordinated acts of sabotage against water supplies, electrical companies – maybe even hospitals. Worst of all, the impending climate collapse. What can you do when forces far beyond your control are at work? Business as usual? That’s what most people here in Sweden want to play at. Barbecue in the countryside and start fires. Fly to Thailand and back again a couple of times. After all, everything is always someone else’s responsibility. Xenophobia is rearing its ugly head again. Recently, a homeless Romanian man was brutally murdered by minor boys. And most people don’t even care. I’m terrified of the future. At the moment mostly of the results of the election. Anything might happen. When trouble comes looking for my family I hope we can find a safe place to hide. If you are the owner of Vegan Lynx, or someone who enjoys this blog why not upgrade it to a Featured Listing or Permanent Listing?